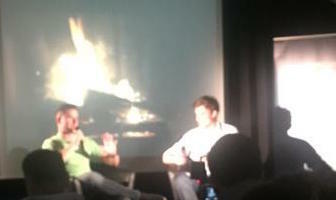 On Tuesday I went along to a Fireside Chat* with Joel Gascoigne, co-founder and CEO at Buffer. Buffer is a really handy software application which you can use for free to schedule posts to social media accounts in Twitter, Facebook, LinkedIn and more. Joel studied in the West Midlands at the University of Warwick, and Buffer was developed and launched in 2010 while he lived in Digbeth, Birmingham. The co-founders moved to Silicon Valley in 2011 and have always been the subject of much interest and attention because of their radically open and transparent business practices. Buffer made the salary calculations and salaries of each team member public and openly publish revenues from their paid for products. They are fully transparent with email (all team members can see all emails) and they have introduced transparent pricing so you see where every penny (or cent) goes if you subscribe to a paid plan. In Buffer one of their values is default to transparency. I thoroughly enjoyed hearing Joel share his story and respond to questions which were submitted through twitter. And it got me thinking about what we’re sharing about Dudley CVS. Then I realised we haven’t really talked much about some priorities we’ve developed this year, and now is a great time to share them here because we have just started getting together as staff and board members to take each of them forward. Our priorities have been shaped in response to what we heard from our sector in a survey we carried out late last year (Kate shared the findings in this post) and also give focus to key areas of activity we have been developing. Here is a run down of our 5 priorities. Our survey told us that the top request in relation to support we should offer over the next year was raising the profile of the voluntary and community sector. A group of Dudley CVS staff and trustees met last week to begin collective work around this priority, so you’ll soon be seeing a growing offer to groups and organisations around this. Do get in touch with Becky (smallgroups@dudleycvs.org.uk) if you have skills or ideas to contribute to our work around this. While we offer support around these areas already, we think there will be some value in us offering a programme of support which people can access in different ways. A group of Dudley CVS staff and trustees met last week and discussed some initial ideas, the next step is to involve people from local groups and organisations in shaping the programme. If you’d like to make suggestions please add a comment to this post, if would like to join an informal ideas session in September please let me know (lorna@dudleycvs.org.uk). Ranked fourth in the list of support people want us to offer is supporting and enabling networking and collaboration. And ranked third is creating the conditions for our sector to influence. A group of our staff and trustees will be reviewing pervious and current work around this and shaping what we can do in the next 12 months. I have already been sharing some examples of activity over the last few years and thinking on collaborative practices on the CoLab Dudley blog. We’ll keep you updated on the work of the group looking at this priority, our first meeting will be next month. Dudley CVS and a number of voluntary organisations in the borough are changing their approach to working with people, and using a tool called PSIAMS to help them manage relationships, communicate and collaborate within and across teams, and to measure the impact and value of their work. We already have a great team supporting the use of the approach and software (Mark Ellerby from Cloudberry, plus Dudley CVS officers James Baggot and Adam Deyes). There will also be a trustee and staff group working on ways that our sector can collaborate and demonstrate impact. Over the last few years Dudley Council has been working with Dudley CVS to explore ways to make the most of the council’s underused buildings and land in a challenging climate and safeguard them (or even unlock them) for community use. Asset transfer was a option for one building we looked at, a management move was an option in another. The council is continuing to develop and test new processes which involve community-based organisations taking on facilities. The initial steps with us should help to set the tone and ease this transition for other facilities and organisations. Dudley CVS are now managing Brierley Hill Civic, and we have staff and a Lunch on the Run cafe moving in to a building on Stafford Street in Dudley Town Centre (the name of the building will be revealed shortly). It is really important to us that we both show that we can make a financial success of such ventures, and that we can do that in ways which support, connect and benefit local communities, groups, clubs and societies, as well as our sector more widely. We have a group of trustees and staff with a diversity of skills and connections who will give time to making ensuring we achieve this. Do leave a comment or get in touch if you have any thoughts on any of our priorities, and please do share links to information about what your group or organisation is currently focusing on. We’d love to hear about it! For anyone interested in the Buffer event, I’ve archived some useful links, tweets and pictures from the Fireside Chat here. *Fireside Chats were a series of radio addresses given by President Franklin Roosevelt and the contemporary spin on this at the event I went to was a backdrop of a 3 hour You Tube fireplace video screened for the entire duration of the talk. It was nearly as mesmerising as a real fire! Sounds great Lorna, thanks for sharing!